Giant left atrium (GLA) is a rare condition closely related to rheumatic mitral valve disease. The database of the Echocardiography Laboratory of the Cardiology Department at Hamad Medical Corporation in Doha, Qatar was reviewed spanning the period from January 1996 to December 2011. To diagnose GLA, we chose an 8 cm or more anteroposterior diameter of the left atrium measured in the parasternal long axis view by transthoracic echocardiography. Using this criterion, we found thirteen (13) cases that fulfil the criteria of giant left atrium. The clinical profile of two cases is presented as well as a discussion of the definition, etiologies, clinical presentation, and management modalities of giant left atrium. An 83-year-old man was admitted to Hamad Hospital with a chief complaint of progressive shortness of breath. There was no orthopnea and no paroxysmal nocturnal dyspnea. There was no chest pain or any other cardiac complaint. There were no complaints of voice hoarseness, dysphagia or any other gastrointestinal symptoms. The past medical history revealed rheumatic mitral valve disease for which mechanical mitral valve prosthesis was implanted at 53 years of age. He has chronic atrial fibrillation and a history of NSTEMI one year prior to admission. At the time of admission, he was conscious, alert, oriented to time place and person. Vital signs revealed an irregular pulse 110 b/m, BP 135/85 and temperature of 37°C. Heart examination revealed the sharp click of the prosthesis with a grade 2 to 3 pan systolic murmur at the apex. Chest examination showed mild bilateral fine basal crepitation. Other systems examinations were unremarkable. An ECG showed atrial fibrillation with left bundle branch block. The chest X-ray showed a cardio-thoracic ratio of 0.8, with haziness of both lung fields, well seated mitral valve prosthesis [Figure 1]a. The laboratory profile was normal. At the time of admission, he was on treatment with diuretics, digoxin and warfarin with an INR 3.5. 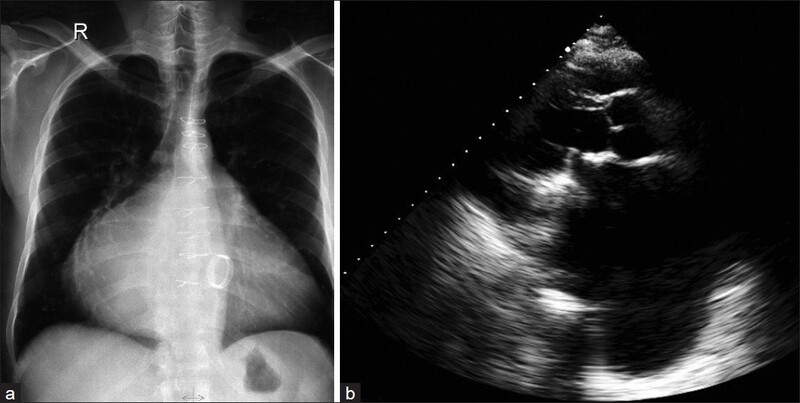 Transthoracic echocardiography [Figure 1]b revealed a markedly dilated left atrium with an anteroposterior diameter of 10.8 cm; the estimated left atrial volume was 739 ml. There was moderate to severe mitral prosthesis regurgitation with a paravalvular leak; the mitral transprosthetic mean gradient was 3 mmHg. There was mild incompetence of the aortic valve. The pulmonary artery systolic pressure was 38 mmHg. The rest ejection fraction was 45%. A transesophageal study was performed to assess the mitral valve prosthesis. The bileaflet prosthesis was well-seated with good excursion. There was trivial central regurgitation and trivial paravalvular leak. The giant left atrium was filled with "heavy smoke" shadow but no definite thrombi. The left atrium appendage looked plicated. A diagnosis of decompensated heart failure syndrome was made, and oral treatment with furosemide, spironolactone and angiotensin receptor blocker was prescribed and warfarin was continued. A 29-year-old asymptomatic man with mechanical mitral prosthesis was referred for follow up outpatient echocardiography. He had a past medical history of rheumatic heart disease with severe mitral stenosis and severe mitral regurgitation and chronic atrial fibrillation. He underwent mitral valve replacement with mechanical prosthesis one year prior to presentation. Preoperatively, the patient gave a history of shortness of breath but no complaints of voice hoarseness, dysphagia or any other gastrointestinal symptoms. On examination, he was conscious, alert, oriented to time, place and person. Pulse was irregularly irregular 70b/m, BP 110/70 mmHg. On cardiac auscultation, the sharp metallic sound of the prosthesis was heard. The chest examination was normal. Other systems examinations were unremarkable. The ECG showed atrial fibrillation. The pre-operative chest X-ray [Figure 2]a showed a cardiothoracic ratio 0.8, a prominent right cardiac border, left atrial enlargement, splaying and lifting of the carina as well as left and right main bronchus. Preoperative echocardiography [Figure 2]b showed a hugely dilated left atrium, with an anteroposterior diameter of 12.1 cm in the parasternal long axis view. The estimated left atrial volume was 667 ml. There was severe mitral stenosis (MVA = 0.7 cm 2 by pressure half time and a mean diastolic pressure gradient of 13 mmHg at rest). Color Doppler showed severe mitral regurgitation. The left ventricle was enlarged with a systolic ejection fraction of 55%. There was trivial aortic incompetence. The systolic pulmonary artery pressure was 33 mmHg. Postoperatively, the chest X-ray [Figure 3]a showed no significant change except for the presence of mitral prothesis and sternotomy sutures. Post operative follow-up by echocardiography [Figure 3]b one year post surgery showed a decrease in left atrial size from 12.1 cm to 10 cm in the anteroposterior diameter. The estimated left atrial volume was 574 ml. The ejection fraction was unchanged. His medications were angiotensin receptor blocker and warfarin. From January 1, 1996 to December 31, 2011 (16 years), there were 13 (0.6%) cases of giant left atrium. During this period, the total number of echocardiography was 118,624 studies (77,428 patients); 2268 (2.9%) patients were diagnosed as rheumatic heart disease. Mitral valve disease etiology represented 85% of the 13 cases of giant left atrium, seven were males (53.8%) and six were females (46.2%). Their age ranged from 25 to 84 years, with a mean age of 51.7 years. All patients were from Middle Eastern countries, except one from the Far East. [Table 1] shows the underlying etiology and [Table 2] shows the interventions performed. The left atrial anteroposterior diameter was measured by M mode echocardiography in the long axis parasternal view. It varied between 8 and 12.1 cm with a mean of 8.9 cm. The left atrial volume was also calculated using the area length method  and was retrieved from only six patient studies. It varied from 364.3 ml to 921 ml with a mean volume of 593.96 ml. Rheumatic heart disease (RHD) continues to be a common health problem in the developing world, causing morbidity and mortality among both children and adults. The occurrence of GLA in our institution is 0.6%, which is higher than the 0.3% reported in the literature. The majority of residents in Qatar are expatriates who are manual laborers from third world countries and rheumatic heart disease is quite common in this population subgroup. Piccoli et al defined the giant left atrium as a cardio-thoracic ratio on CXR of >0.7 combined with a left atrial anterior-posterior diameter of >8 cm on transthoracic echocardiography. Other investigators  have decreased the LA size for diagnosis to 6.5 cm in the parasternal long axis view. The lateral extension of the cardiac border reflects left atrial dilatation toward the right borders of the chest wall as seen on the CXR. The echocardiographic diameter measures the anteroposterior extension of the left atrium. However, measurement of the left atrial volume will theoretically incorporate the dilatation in both directions. Therefore, we believe that the left atrial volume and left atrial volume index should be incorporated in the definition but this remains to be validated in further studies. Many case reports associate giant left atrium to rheumatic pathology, ,,,,,,,,,,, but a few reports associate GLA with a non-rheumatic etiology. Phua et al and Brownsberger et al, reported GLA due to mitral valve prolapse. Yuksel et al, reported it with hypertrophic cardiomyopathy. Another case report was published by Cheng et al associating this condition with cardiac amyloidosis, causing a restrictive cardiomyopathy pattern. Most reports in the literature, as in the two cases presented had a rheumatic origin, as suggested by the history. Hurst  attributed the dilatation of the left atrium to the rheumatic process causing pancarditis. However, pathological studies have failed to reveal the Aschoff nodules (fibrinoid necrotic center found in the myocardium surrounding blood vessels, and other regions of the body) in the atrial tissues; rather, these studies found fibrosis with chronic inflammatory findings. This supports the explanation that the left atrium progressively enlarges secondary to longstanding chronic volume and pressure overload more than being a part of the rheumatic process. Atrial fibrillation, which can occur secondary to left atrial enlargement, contributes more to the increase in overload on the left atrium and causes more enlargement. As mentioned by Hurst  and Le Roux,  anatomically [Figure 4], the left atrium is not a left-sided structure and this chamber is the most posterior structure of the heart. The four pulmonary veins enter the left atrium in a square shape; the side of which is maximally 4 cm. The left atrium extends more to the left side forming the left atrial appendage. On the right side, the left atrial wall rarely exceeds 1 cm in width. Anteriorly, the inter-atrial septum separates the left and right atriums. 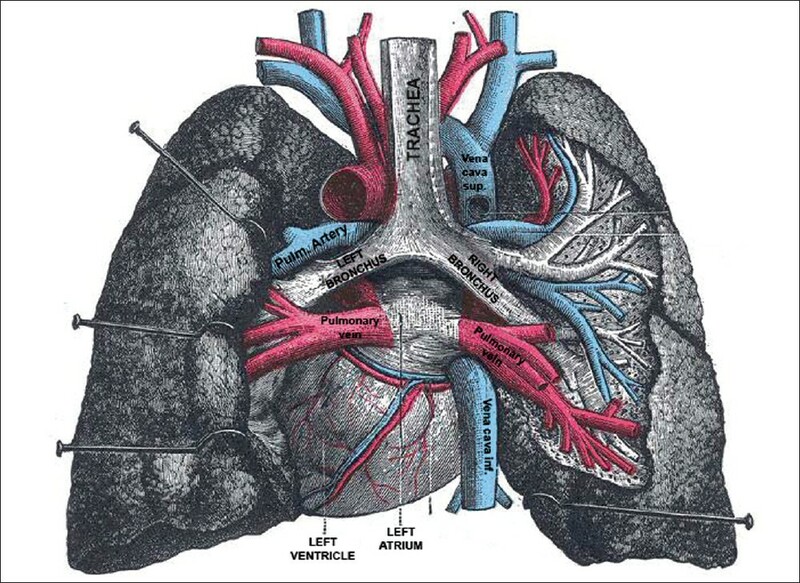 Posteriorly, the left atrium is closely related to the main bronchus of both lungs. The esophagus and the descending thoracic aorta lie posterior to the left atrium. Therefore, giant left atrium can cause intra-cardiac or extra-cardiac compression manifestations. Other investigators  have reported left lung collapse caused by compression of the distal main bronchus and collapse of the right middle lobe due to direct compression. Posterior displacement of the esophagus is a logical result of left atrial enlargement which can be symptomatic causing dysphagia  in extreme enlargement of the left atrium. Nigri  reported a rare complication of the giant left atrium, pushing the heart to the right side of the thorax mimicking dextrocardia. In our first patient, there is no available data about his condition before the mitral replacement which was performed 30 years ago. He has no symptoms of compression and the dyspnea that was his main complaint upon admission was first thought to be due to the mitral regurgitation. Transesophageal echocardiography examination revealed only trivial to mild mitral regurgitation. He also had mild to moderate left ventricular impairment which might have contributed to his complaint of dyspnea. The second patient, in spite of his giant left atrium, did not give a history suggesting compression. He was totally asymptomatic after an isolated mitral valve replacement without plication of the left atrium. Thromboembolism is a major complication of giant left atrium. Many cases have been reported in the literature. Before the widespread use of echocardiography, thrombosed giant left atrium was mistaken for mediastinal tumor. Echocardiography enabled the possible association of left atrial thrombus with giant left atrium. This complication was seen in patients before and after mitral valve replacement. , Kutay et al compared the incidence of thromboembolic event in patients with and without giant left atrium after mitral valve replacement without left atrial plication. The incidence was comparable in both groups and this was correlated to poor socioeconomic status causing non-compliance to anticoagulation. Anticoagulant therapy can effectively prevent thromboembolic complications with giant left atrium. Non-compliance to anticoagulation is the major cause for this complication whatever the left atrial size. Therefore, a giant left atrium is an indication for the initiation of anti-coagulant therapy. None of our patients had evidence of thromboembolic manifestations. They were anticoagulated with an international normalized ratio range between 2.5 and 3.5. The first patient showed spontaneous echo contrast in the left atrium but no evidence of thrombi. Surgeons who performed left atrial plication believed that the effect of the rheumatic process on the elastic fibers of the tissue is irreversible. This process causes strain and loss of tone; thus, the left atrial enlargement is irreversible. They claimed that by reducing the left atrial size with replacement of the mitral valve, the pressure effect is reduced with favorable effect on the postoperative course. Tamura et al presented a case of severe mitral stenosis and regurgitation. This patient had mitral valve replacement with left atrial volume reduction. The immediate postoperative period showed relief of the compression with widening of the main bronchus diameter and decrease of the angle of the carina with improvement in respiratory functions. Surgeons who treated mitral valve disease with giant left atrium by only replacing the mitral valve believed that prolongation of the cardiopulmonary bypass time in these patients does not warrant left atrial plication except when the atrium compresses the lung as to produce atelectasis. In the study by Johnson and colleagues,  left atrial plication with a right thoracotomy had higher incidences of mortality and low cardiac output, and it was stated that this procedure would be effective only to increase lung ventilation. More recently, in 2001, another group  compared the two surgical strategies. They showed that the reduction in left atrial size was comparable in both groups. Giant left atrium had also been recognized as refractory for regular cardioversion procedures either medically or electrically. This was possibly due to the fibrotic and calcified degeneration of the left atrial myocardium. Yuda et al studied the efficacy of the Maze procedure in restoration of atrial contraction in patients with giant left atrium in comparison to those without giant left atrium. They differentiated between restoration of sinus rhythm on the ECG which reflects the return of the electrical activity and not necessarily the atrial contraction. Return of atrial contraction had been defined in his study as the appearance of A wave on the Doppler mitral inflow pattern by pulsed wave with a peak velocity of at least 10 cm/s. After one year follow-up, normal sinus rhythm was obtained in 53% of the giant left atrium in comparison to more than 75% in non giant left atrium. Atrial contraction was regained in 20% of patients with giant left atrium in comparison to more than 50% in non giant left atrium. Another more recent study  used the Maze procedure concomitant with mitral valve surgery with or without tricuspid valve surgery and biatrial reduction surgery. The results of this study confirmed the previous one. The bigger the left atrium, the lower is the percent of restoration of sinus rhythm. None of our patients had left atrial placation or Maze procedure. Possibly atrial reduction surgery was not indicated from the start. In view of the absence of compression manifestations, the left atrium dimensions fulfilled the criteria of GLA. Atrial fibrillation rhythm remained and was medically controlled. Anticogulation prevented thromboembolism. Surgical treatment of giant left atrium with mitral valve disease and atrial fibrillation with complex procedures including mitral valve replacement, atrial reduction surgery with or without Maze procedure is a viable option when indicated. However, we still believe that in cases without intra-cardiac or extra-cardiac compression, simple mitral valve replacement is sufficient. Nowadays, giant left atrium is rarely seen and needs a high index of suspicion. It is typically found in patients who have rheumatic mitral valve disease with severe regurgitation.The correct diagnosis of left atrial enlargement is at times not possible by routine CXR alone. It may be misdiagnosed as a mass lesion or pleural or pericardial effusion. Pericardiocentesis, pleurocentesis, or biopsy are dangerous in this setting and other diagnostic modalities are needed. Echocardiography is an excellent modality to establish its diagnosis, assess etiology, and direct the correct management. 1. Wang Y, Gutman JM, Heilbron D, Wahr D, Schiller NB. Atrial volume in a normal adult population by two-dimensional echocardiography. Chest 1984;86:595-601. 2. Hurst W. Memories of patients with a giant left atrium. Circulation 2001;104:2630-1. 3. Piccoli GP, Massini C, Di Eusanio G, Ballerini L, Tacobone G, Soro A, et al. Giant left atrium and mitral valve disease: Early and late results of surgical treatment in 40 cases. J Cardiovasc Surg 1984;25:328-36. 4. Oh JK. Echocardiographic evaluation of morphological and hemodynamic significance of giant left atrium. Circulation 1992;86:328-30. 5. Owen I, Fenton WJ. A case of extreme dilatation of the left auricle of the heart. Trans Clin Soc London 1901;34:183-91. 6. Schvartzman PR, White RD. Giant left atrium. Circulation 2001;104:e28-9. 7. Rimon D, Cohen L, Rosenfeld J. Thrombosed giant left atrium mimicking a mediastinal tumor. Chest 1977;71:406-8. 8. Goldenberg G, Eisen A, Weisenberg N, Amital H. Giant left atrium. IMAJ 2009;11:641. 9. Tung R, DeSanctis R. Giant left atrium. NEJM 2004;351:1437. 10. Fasseas P, Lee-Dorn R, Sokil AB, VanDecker W. Giant left atrium. Texas Heart Inst J 2001;28:158-9. 11. Ates M, Sensoz Y, Abay G, Akcar M. Giant left atrium with rheumatic mitral stenosis. Texas Heart Inst J 2006;33:389-91. 12. Celik T, Bozlar U, Celik M, demirkol S, Iyisoy A, Cingoz F. Giant left atrium in a patient with starr-Edwards caged ball implanted three decades ago. Cardiovasc Revasc Med 2011;12:266-7. 13. Rajakaruna C, Mhandu P, Ghosh-Dastidar M, Desai J. Giant left atrium secondary to severe mixed mitral valve pathology. Eur J Cardio Thoracic Surg 2007;32:932. 14. Kronzon I, Mehta SS. Giant left atrium. Chest 1974;65:677-9. 15. Ananthasubramaniam K, Iyer G and Karthikeyan V. Giant left atrium secondary to tight mitral stenosis leading to acquired Lutembacher syndrome: A case report with emphasis on echocardiography in assessment of Lutembacher syndrome. J Am Soc Echocardiogr 2001;14:1033-5. 16. Funk M, Perez M, Santana O. Asymptomatic giant left atrium. Clin Cardiol 2010;33: e104-5. 17. Agrawal AK, Gupta AK, Gupta VK, Kharb S. Giant left atrium. A rare entity in rheumatic valvular heart disease. J Indian Acad Clin Med 2008;9:227-9. 18. Parrinello G, Torres D, Paterna S, Mezzero M, Di Pasquale P, Trapanese C, et al. Giant left atrium in a woman with mitral prosthetic valve malfunction and history of rheumatic heart disease. Intern Emerg Med 2009;4:435-7. 19. Phua GC, Eng PC, Lim SL, Chua YL. 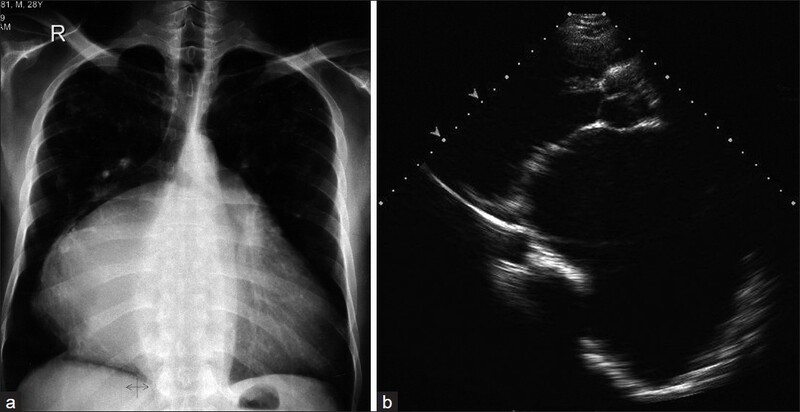 Beyond Ortner's syndrome - Unusual pulmonary complications of the giant left atrium. Ann Acad Med 2005;34:642-5. 20. Brownsberger RJ, Morrelli HF. Hoarseness due to mitral valve prolapse. J Am Geriatr Soc 1988;36:442-3. 21. Yuksel UC, Kursaklioglu H, Celik T. Apical hypertrophic cardiomyopathy with giant left atrium. Arq Bras Cardiol 2007;88:e47. 22. Cheng Z, Fang Q, Liu Y. Cardiac amyloidisis with giant atria. Heart 2010;96:1820. 23. Plaschkes J, Borman J, Merin G, Milwidsky H. Giant left atrium in rheumatic heart disease: A report of 18 cases treated by mitral valve replacement. Ann Surg 1971;174:194-201. 24. Le Roux BT, Gotsman MS. Giant left atrium. Thorax 1970;25:190-8. 25. Minagoe S, Yoshikawa J, Youshida K, Akasaka T, Shakudo M, Maeda K, et al. Obstruction of the inferior vena caval orifice by giant left atrium in patients with mitral stenosis. A Doppler echocardiographic study from the right parasternal approach. Circulation 1992;86:214-25. 26. Castrillo C, Rivas AO, De Berrazueta JR. Giant left atrium mimicking right heart failure. Eur Heart J 2008;29:1056. 27. Tonguç E, Kestelli M, Özsöyler I, Yilik L, Yýlmaz A, Özbek C, et al. Limit of indication for placation of giant left atrium. Asian Cardiovasc Thorac Ann 2001;9:24-6. 28. Nigri M, Fernandes JL, Rochitte CE. Giant left atrium and a right sided heart. Heart 2007;93:475. 29. Okyay K, Cengel A, Tavil Y. Images in cardiology. A giant left atrium with two huge thombi without embolic complications. Can J Cardiol 2007;23:1088. 30. Popescu B, Lupescu I, Georgescu S, Ginghina C. Giant left atrium with calcified walls and thrombus in a patient with an old, normally functioning ball-in-cage mitral valve prosthesis. Circulation 2010;122:e579-80. 31. Kutay V, Kirali K, Ekim H, Yakut C. Effect of giant left atrium on thromboembolism after mitral valve replacement. Asian Cardiovasc Thorac Ann 2005;13:107-11. 32. Apostolakis E, Shuhaiber JH. The surgical management of giant left atrium. Eur J Cardiothorac Surg 2008;33:182-90. 33. Tamua Y, Nagasaka S, Abe T, Taniguchi S. Reasonable and effective volume reduction of a giant left atrium associated with mitral valve disease. Ann Thoracic Cardiovasc Surg 2008;14:252-5. 34. Johnson J, Danielson GK, MacVaug H III, Joyner CR. Plication of the giant left atrium at operation for severe mitral regurgitation. Surgery 1967;61:118-21. 35. Yuda A, Nakatini S, Isobe F, Kosakai Y, Miyataki K. Comparative efficacy of the Maze procedure for restoration of atrial contraction in patients with and without giant left atrium associated with mitral valve disease. JACC 1998;31:1097-102. 36. Wang W, Guo LR, Martland AM, Feng XD, Ma J, Feng Q. Biatrial reduction plasty with reef imbricate technique as an adjunct to Maze procedure for permanent atrial fibrillation associated with giant atria. Interact Cardiovasc Thorac Surg 2010;10:571-81.